• Taxes are coming up! March means two things: spring break and taxes! 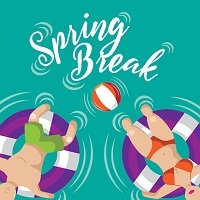 We are here to help, as this newsletter is packed with information on how to make the most of your spring break, and important resources to help you file your taxes before the April deadline! University of Dayton - A top-tier Catholic research university committed in the Marianist tradition, University of Dayton is Ohio’s top university for sponsored materials research and development. Heartland Community College - A two-year fully accredited institution, Heartland supports its students success with affordable education and personalized academic services. Farmingdale State College - Named one of the best colleges in the North by US News and World Report 2015, Farmingdale prepares its students through real-world technology. The moment that many of you have been waiting for is about to arrive: spring break! If you’re trying to plan the perfect trip but also need to stay within a strict budget, using our travel center is a must! There you’ll find great deals on flights, hotels & hostels, rail passes, car rentals and other travel necessities. Add memories, not bills this spring break! This month’s Ask an Advisor is Kandy Turner, Director of International Student Services and Programs at Widener University. Located just 20 minutes away from Philadelphia, Pennsylvania, Widener is one of the nation’s top universities for civil engagement. Don’t miss your chance to ask Kandy your questions, as she has more than 10 years of experience in the field!